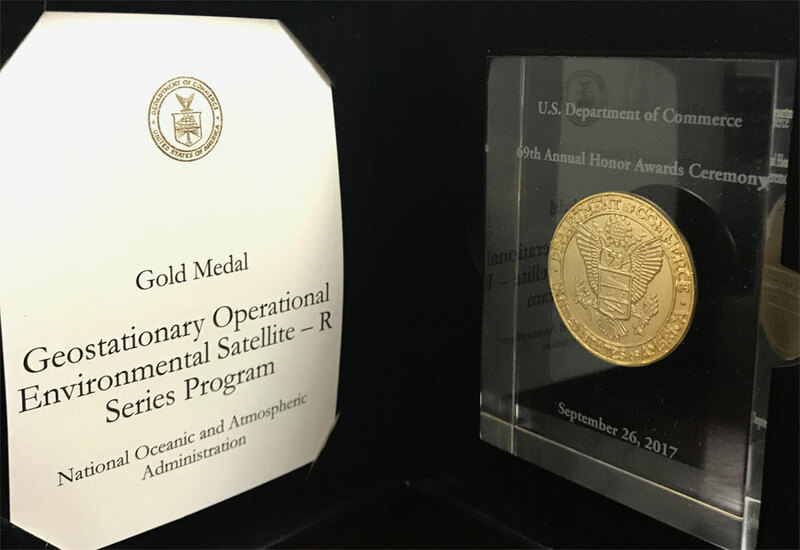 September 27, 2017 – On September 26, 2017, acting GOES-R Series Program Director Mike Stringer accepted the Department of Commerce Gold Medal on behalf of the GOES-R team at the 69th Annual Honor Awards Ceremony. The Gold Medal, the highest honorary award given by the Department of Commerce, is granted by the Secretary for distinguished performance, characterized by extraordinary, notable, or prestigious contributions that impact the mission of the Department and/or one operating unit and that reflect favorably on the Department. The GOES-R program is a collaboration between NASA and NOAA. The satellites are being built by Lockheed Martin Space Systems in Littleton, Colorado. In addition to the spacecraft, Lockheed Martin also provides the Magnetometer, the Geostationary Lightning Mapper (GLM), and the Solar Ultra-Violet Imager (SUVI). The University of Colorado Boulder’s Laboratory for Atmospheric and Space Physics (LASP) provides the Extreme ultraviolet/X-ray Irradiance Sensors (EXIS). GOES-R (now known as GOES-16) launched on a United Launch Alliance (ULA) Atlas V 541 rocket on November 19, 2016.